I can’t take full credit for this recipe, Gordon Ramsey definitely gave me inspiration with his bacon, red pepper, pea, and spring onion frittata. But, he didn’t add enough fats for me so I manipulated the recipe a bit to allow for more fats (mushrooms help out with the absorption of those) to create an absolutely delicious breakfast or brunch for you to share and enjoy! Heck, even I don’t want to share this, so if you’re like me, you can just portion this out into 6 servings and eat it for breakfast, brunch, or dinner on the days to come! If you need to take in less calories, feel free to slice this into 8 or 10 slices. A simple bread knife will easily slice through this with out breaking up the other ingredients. Just remember when you’re cooking that it’s always best to add salt and pepper then. Taste as you cook and adjust salt levels as needed. You don’t want to dump it all in at the end because then the salt and pepper won’t have a chance to impart themselves to enhance the flavors of your food. 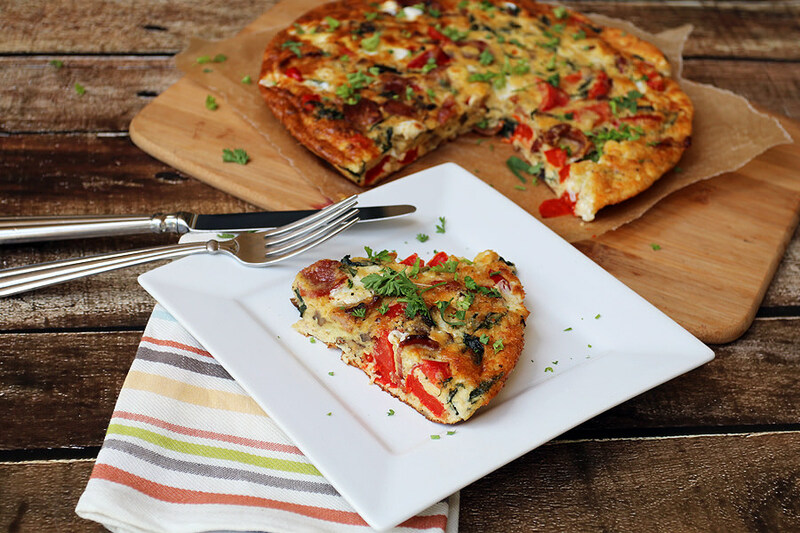 If you like recipes like this, be sure to check out the new cookbook I released: Ketofied! Comfort Foods Made Low Carb. It’s packed full of great comfort foods that you thought you’d never have again on a ketogeic (or low-carb) diet. 1. Preheat oven to 350F. Prep all of your vegetables first. Roughly chop 1 medium Red Bell Pepper, 7 Slices of Bacon, enough basil to turn into 1/2 cup, and 4 large Baby Bella Mushroom caps (remove stems prior to chopping). 2. In a hot pan, add 1 tbsp. olive oil. 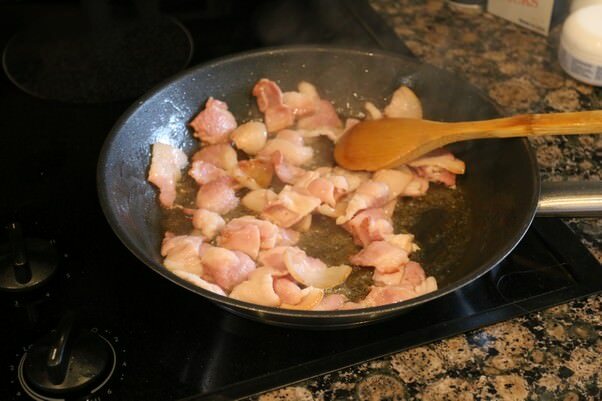 When the first wisp of smoke appears, add bacon to the pan immediately. 3. Cook the bacon just enough so that it starts to turn brown. Once that happens, add the chopped red bell pepper. Stir well. 4. While the red pepper is cooking, prep the egg mixture. Add 8 or 9 large eggs to a large mixing bowl along with 1/4 cup heavy cream, 1/4 cup parmesan cheese, and freshly ground pepper. Remember that parmesan has a salty quality to it so you shouldn’t need to add extra salt here. 5. 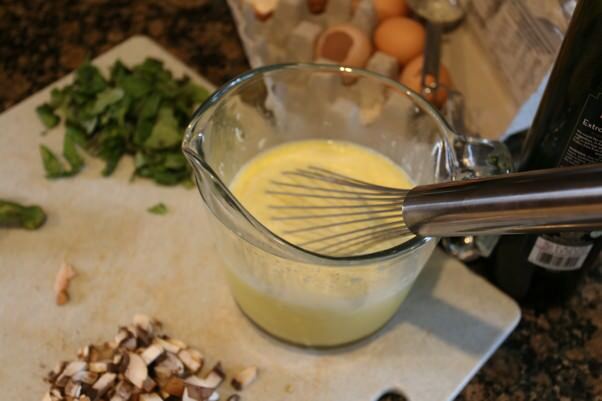 Using a whisk, whisk the egg mixture well so that everything is combined. 6. 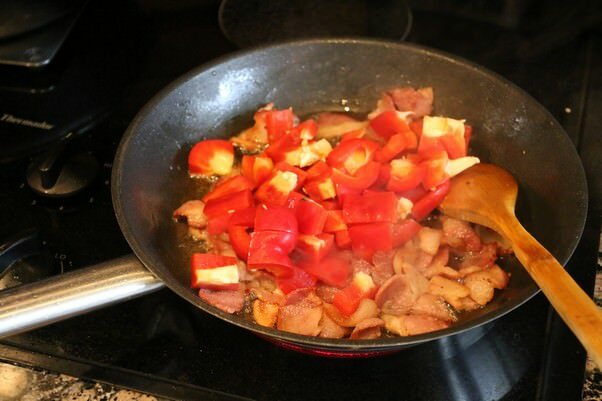 Once your red bell peppers begin to soften, add mushrooms to the pan and stir in well. You want the mushrooms to begin soaking up all the extra fats in the pan. 7. While the mushrooms are soaking up the fats, chop your 4 oz. 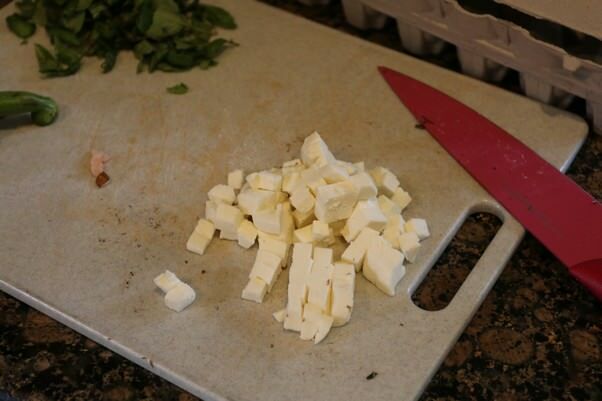 fresh mozzarella into cubes. 8. 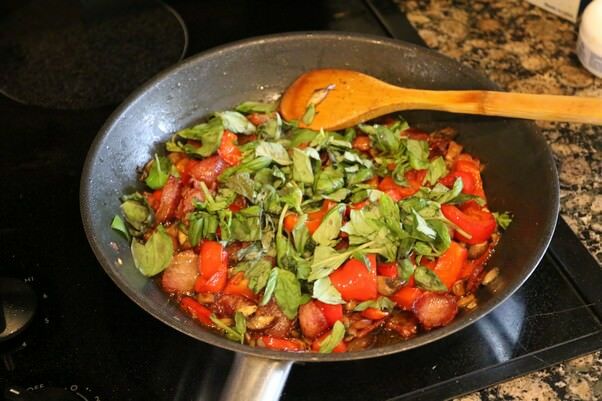 Add the basil to the top of your ingredients and let it steam for a moment. 9. Sprinkle the mozzarella cubes on top of all the bacon and veggies. 10. 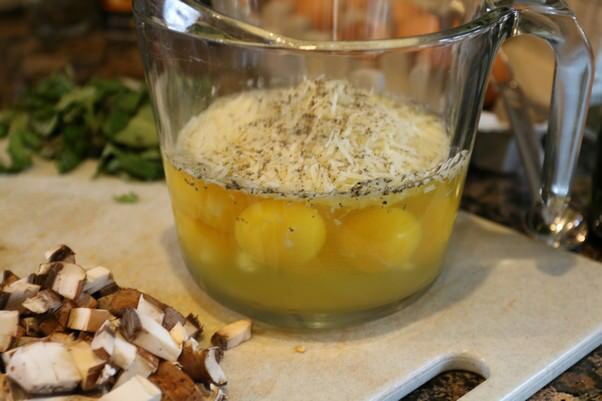 Add your egg mixture to the pan, making sure it’s evenly distributed. 11. Using your spoon, slowly mix the ingredients and “lift” the ingredients up so that the egg can get to the bottom of the pan. 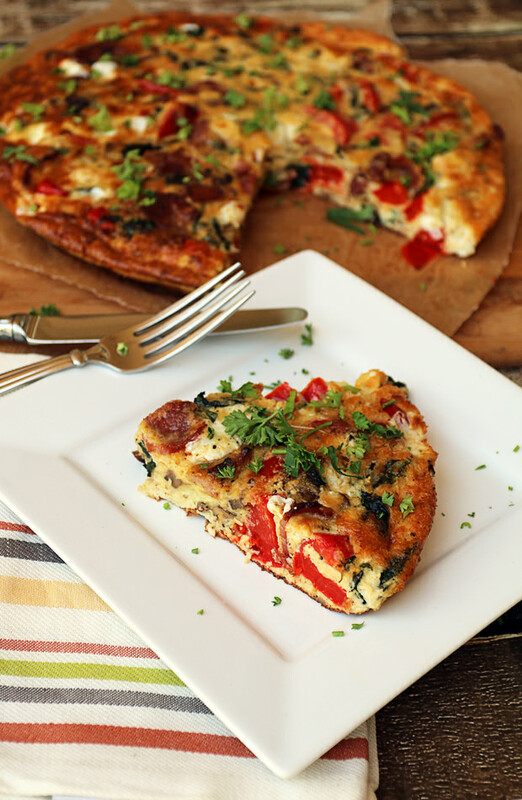 You want the eggs to be all around and underneath the bacon, red pepper, and mushrooms. 12. Grate 2 oz. of goat cheese over the top of the frittata, the put it in the oven for about 6-8 minutes at 350F. 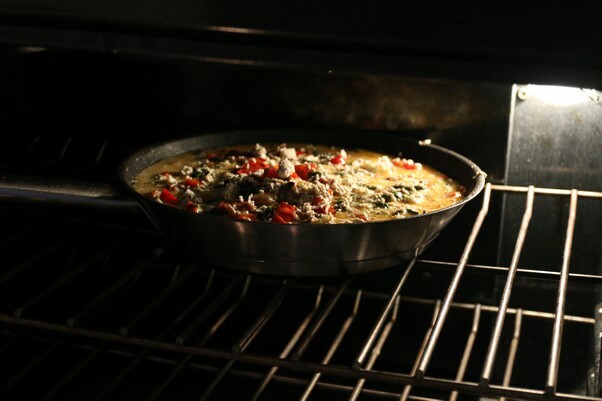 Leave the frittata in the pan and turn the broiler on. Broil for an additional 4-6 minutes, or until the top is started to turn golden brown. 13. 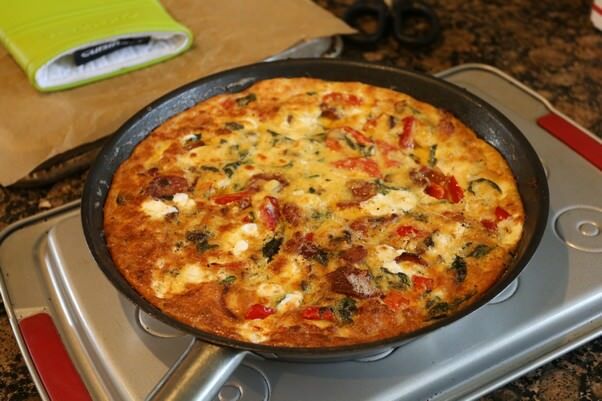 Remove the frittata from the oven and let rest for 30-45 seconds. 14. Using a spoon, pry the edges of the frittata away from the pan. Make sure that all of the sides are easy to come off. 15. 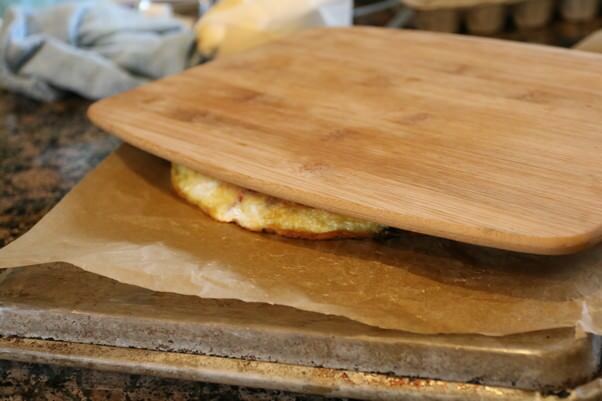 Flip the frittata out of the pan by placing a baking sheet with parchment paper over the top of it. 16. 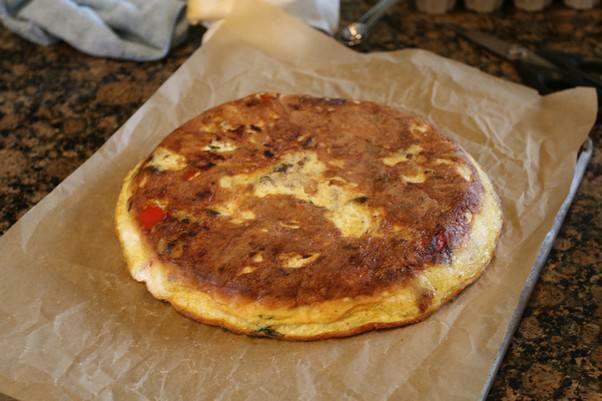 Once out of the pan, use a cutting board to flip the frittata right side up. 17. Garnish with 2 tbsp. fresh chopped parsley and slice! 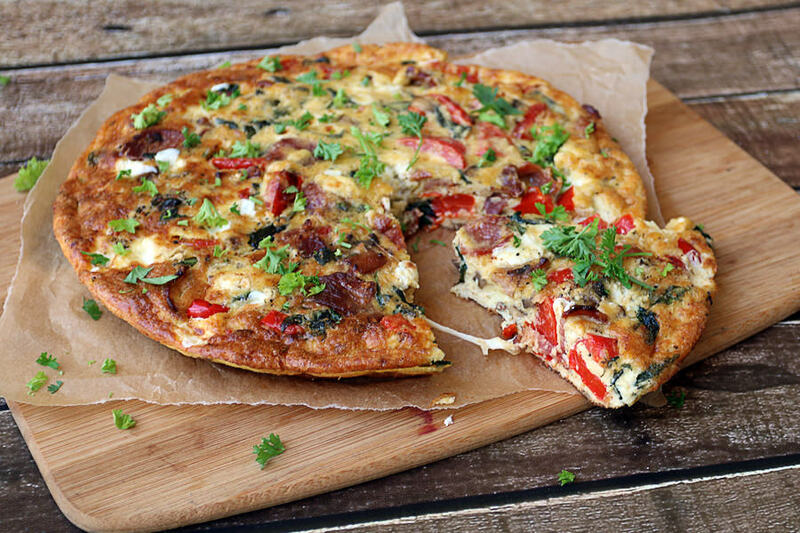 This makes 6 total slices of Bacon, Red Pepper, and Mozzerella Frittata. Each slice comes out to 424 Calories, 34.82g Fats, 3.63g Net Carbs, and 22.9g Protein. Prep all vegetables. 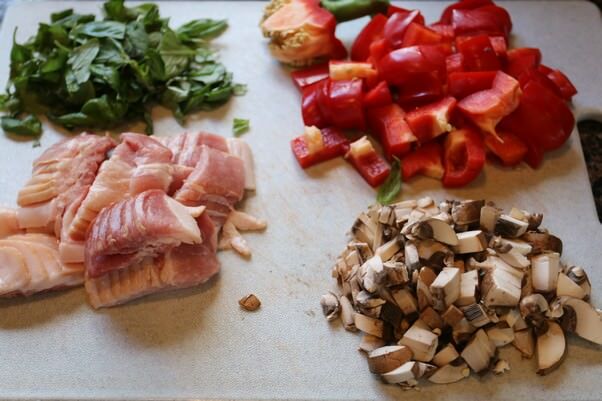 Roughly chop basil, red pepper, mushrooms and bacon. Cube mozzarella and set aside. Preheat oven to 350F. In a hot pan, add olive oil and wait for the first wisp of smoke. Add your bacon immidiately after that first wisp of smoke. Let the bacon cook until browned, then add red pepper. Let the pepper cook in the bacon fat until soft. 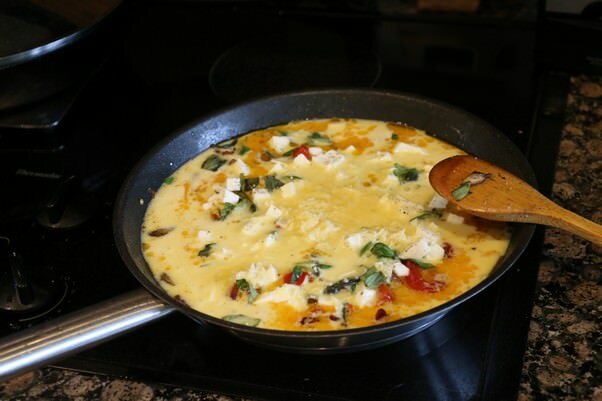 While red peppers are cooking, add 9 eggs, 1/4 cup heavy cream, 1/4 cup parmesan cheese, and fresh ground black pepper to a container. Use a whisk to mix the eggs well. 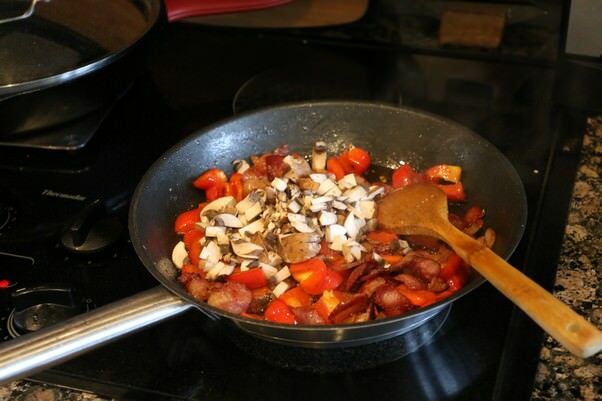 Add the mushrooms to the pan once the red pepper is soft and stir in well. Let the mushrooms soak in the fat. 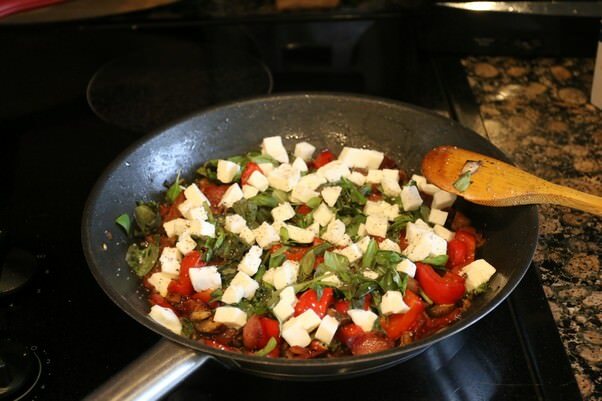 Add fresh basil to pan and let it cook for a moment, then sprinkle cubed mozzarella cheese on top. 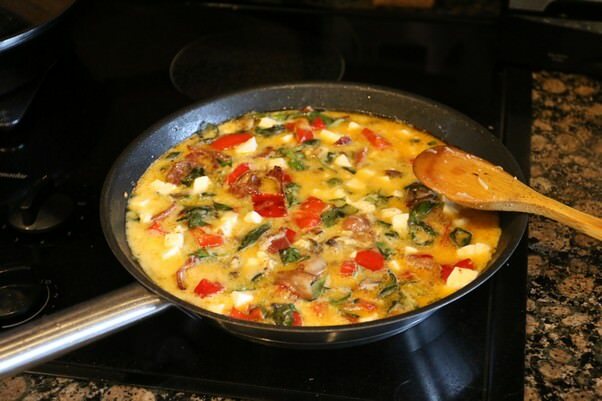 Pour eggs over everything and use a spoon to lift up the ingredients at the bottom of the pan. You want the eggs to get under and around everything in the pan. Grate 2 oz. goat cheese over the top and put it in the oven for 6-8 minutes. Then, turn the broiler on and broil the top for an additional 4-6 minutes. 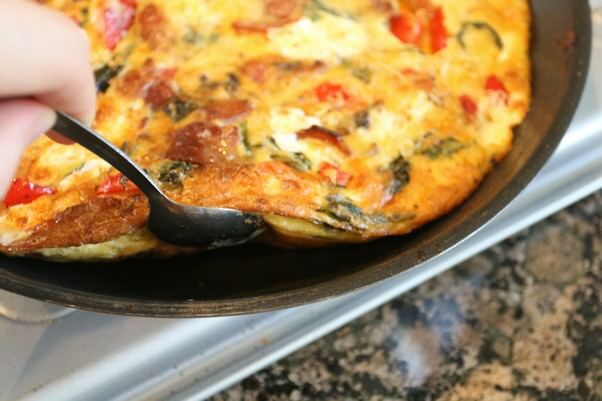 Remove from the oven and using your spoon, pry the edges of the frittata away from the pan. Once done, flip the frittata out of the pan. Slice and serve!